•Secondary : associated with systematic diseases such as D.M., R.A., CTS, de qe vain diseases or post trauma. What are the potential causes of trigger finger ? Repetitive and excessive manual activities: such as carrying plastic bags. Twisting clothes, gardening activities ,digging ,pruning ,driving golf ,chopping meat or bones, cutting meat, pulling lope, screwing with screw-diver etc. Tools of risks: scissors pliers, tongs, pincers spade , knife screwdriver, hammer etc. Who will more affected by trigger fingers ? Females are 3-4 times more common than males. The most frequent groups are women, housewives, or house workers. Who have using hands more repeatedly and sometimes high impact as well as high frequency such as washing twist clothes, carrying heavy bags during shopping, using knife, cutting, chopping pork, chicken or meat, lifting pots, cooking devices, doing gardening trimming braches of tree digging soil. Carrying water containers the frequent and forceful manual exertion might be the reason why housewives suffering from trigger fingers. The culture and habits of Thai women like shopping buying carrying with plastic bags, which can hold twenty or thirty kilograms of weight or even more. 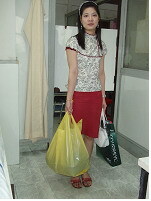 Instead of using trolleys or using paper's bags which they , of course limit for heavy things. And working habits using manual works instead of using machines will cause more wear and tear of finger flexion mechanisms. How do you grading or severity of trigger fingers? Grade 1 : painful tenderness at base of the finger. Grade 2 : uneven finger movements, triggering , unlock by self. Grade 3 : locking finger ,unlock by outside force. Grade 4 : with deformity ,fixed flexion or extension ,bowing, overriding.